From a small town in Germany, two hours drive away from the Alps, Panagiotis Xipteras images the sky with his Tele Vue-NP127is. We noticed his exquisite images on social media and asked him why he choose the NP127is for his imaging scope. He tells us below. 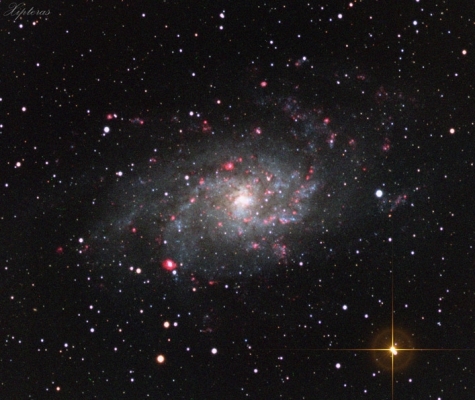 “M33 The Triangulum Galaxy” (cropped) by astrophotographer Panagiotis Xipteras. All rights reserved. Used by permission. Exposures: Hα: 5×600″, RGB: 3×300″ each through Tele Vue-NP127is. Having owned several telescopes in the last two decades, I finally wanted an easy to use, quality instrument manufactured within tight tolerances. It was crucial for me to know that a QA engineer of a company which I can trust, has checked it before delivery. I am also an astrophotographer and I wanted a fast scope doing the job right out of the box. Hence, I followed the advice of Intercon-Spacetec in Germany to purchase this beautiful apochromat. In my opinion, the Tele Vue-NP127is performs the perfect balancing act between portability and performance. 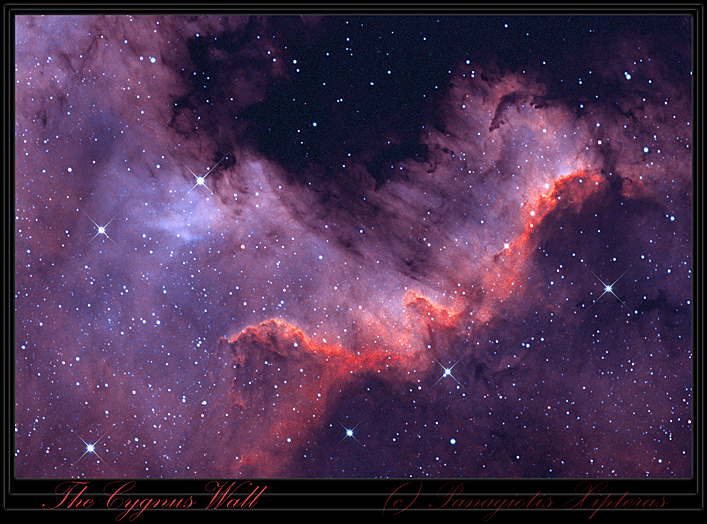 “The Cygnus Wall” by astrophotographer Panagiotis Xipteras. All rights reserved. Used by permission. Exposures: Hα: 4×600″, OIII: 4×600″ (Green from Hα & OIII) through Tele Vue-NP127is. One scope does it all. Visually, the NP127is is like a spaceship window. It can handle very low magnifications, with its flat field, large aperture, and apochromatic capabilities. But I can use it at high powers to observe planet details. All these things also work photographically without tweaking. This kind of flexibility is remarkable, especially if I consider its low weight and high value. Panagiotis’ imaging setup consists of a Tele Vue-NP127is, QSI-683ws8 CCD camera, and a Takahashi JPZ mount on a pier. A Starlight Lodestar on a Tak FS-60C acts as a guider. Bright-star diffraction spikes are added in post-processing using StarSpikes Pro by ProDigital Software. 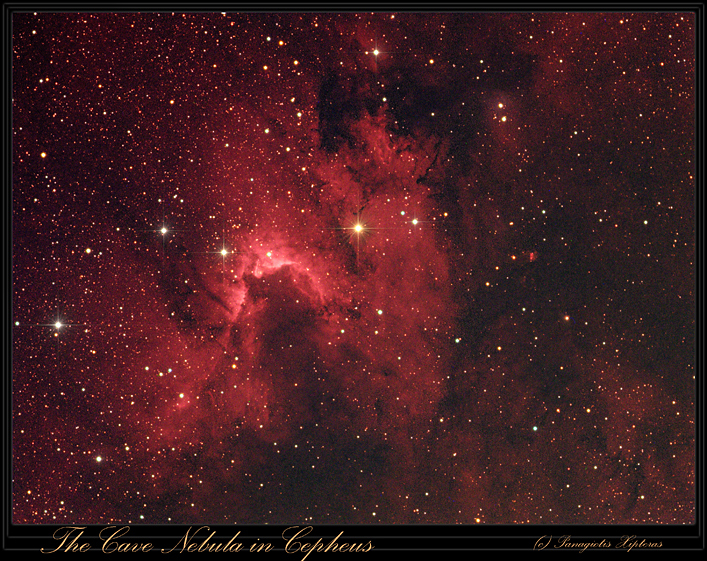 “The Cave Nebula” by astrophotographer Panagiotis Xipteras. All rights reserved. Used by permission. Exposures: Hα: 7×600″, RGB: 2×300″ each through Tele Vue-NP127is. Panagiotis has created a exceptional collection of his best Tele Vue-NP127is images for this blog post. In this image gallery you’ll find: expansive nebulae, some with bright walls of interstellar gas contrasted against dark, dusty regions of cool gas. Galaxies: galactic “island universes” — from gorgeous, face-on spirals displaying graceful, curling arms to edge-on subjects displaying bright central cores sliced-thorough by dusty lanes along the galactic plane. A collection of star clusters also graces the gallery: from a spectacularly dense globular — with hundreds of thousand stars — to younger, open clusters spread out like jewels against a velvet black sky. 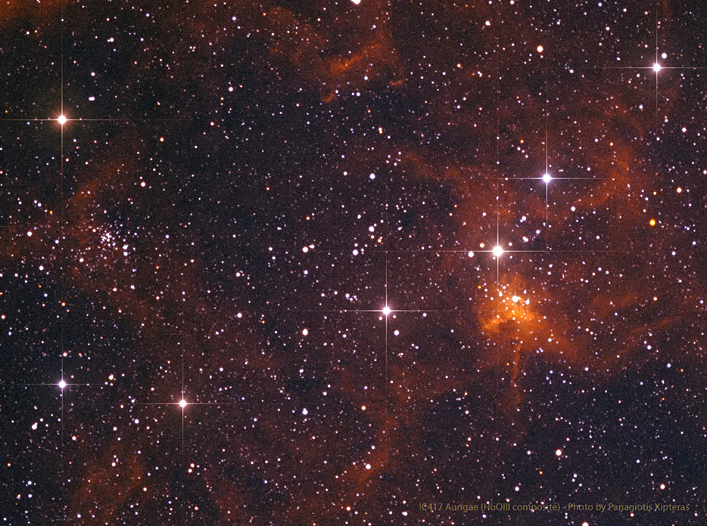 “IC417 in Aurigae (bi-color)” by astrophotographer Panagiotis Xipteras. All rights reserved. Used by permission. Exposures: Hα & OIII: 2x600s each through Tele Vue-NP127is. With a Master of Science in Data Communications, Panagiotis is currently working as a software engineer in the logistics sector. We wish him clear skies and look forward to seeing more of his well-crafted images! Previous Previous post: 10-Years of Ethos SALE! Next Next post: 2017 Eclipse: Naglers in Nashville, TN!